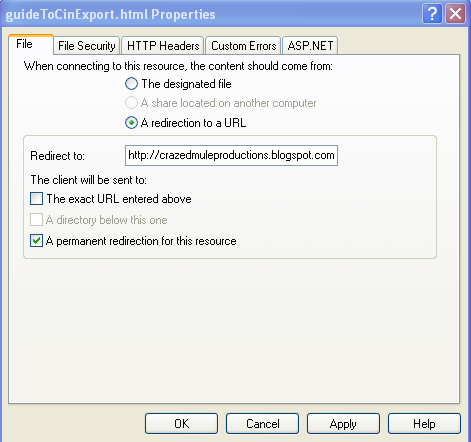 This is different from a Linux box, where you can use not only code or Apache to do the 301, but you can also take advantage of the .htaccess file for redirects. Instead, I used the IIS management console to edit the attributes of the file to permanently redirect the destination location of the file. 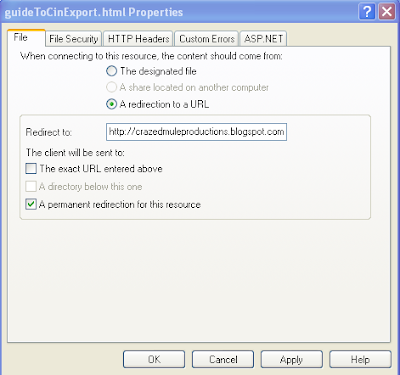 In the example below, I have right-clicked on the Properties of a web resource available to IIS (a file under the wwwroot), have input my other blog "http://crazedmuleproductions.blogspot.com" as the destination URL and checked "a permanent redirection for this resource." Using the internetofficer site's redirect checker, I found that the redirect checker showed the same response from the IIS server. So Firebug wasn't reporting incorrect information. Finally, after a bit of googling, it seems that the "301 error" is just the way that the IIS server responds to the 301 permanent redirection setting. This is confusing, non-standard terminology, as it caused me to think that I had implemented the redirect incorrectly. Perhaps Microsoft will fix this in the future.